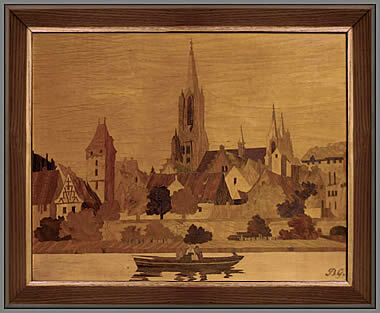 August, brings us some further interesting examples of marquetry work produced by the infamous Buchschmid & Gretaux wood inlay company. Priscilla Gwilt has kindly sent in some photos of her B & G pieces - and enquired about what could be done with the cracking that was appearing on the picture's varnish. 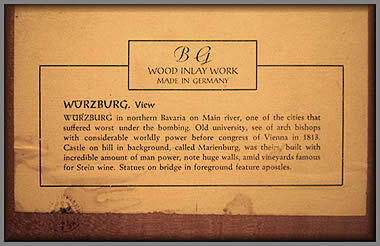 Read our text at the left of the photos to see what should be done if your B & G pictures exhibit the same problem. The other three B & G pictures plus the circular table are displayed courtesy of our very helpful friend Sylvia Smith. 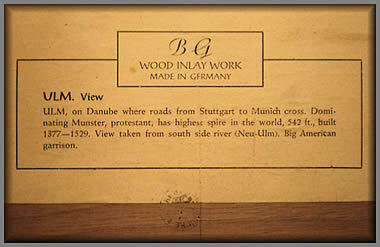 August's updates show some examples of Buchschmid and Gretaux wood inlaid pictures that have suffered the effects of cracked varnish and fading veneer colors. We will look at the reason for both of these conditions occurring in the pictures - and we will discuss the best approach to take when considering restoration procedures. The first of those conditions we will look at then is the cracking that is sometimes seen in the varnish of these pictures. The technical name for the cracking in the varnish is Craquelure. This cracking effect of the varnish is actually quite useful in some circumstances because it can be used to furnish a record of the environmental conditions the picture has experienced during its preceding lifetime. 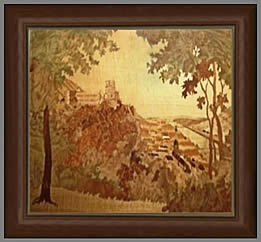 The primary cause of the craquelure or cracking of the varnish is dry heat. The reason for this is that the hydrological properties of the baseboard and the varnish are somewhat diametrically opposed to each other, and where the wooden baseboard will evaporate its water content fairly quickly (in comparative terms) the varnish will naturally take much longer to exude or evaporate its own moisture content. The upshot of this is that the baseboard, having quickly evaporated its water content in the dry heat, will shrink to a certain extent, but the varnish, which has not lost an equivalent level of comparable moisture, will still have remained at its original size. This will naturally present a differential in the surface tensions offered by the baseboard and the varnish layer. As this varnish layer, being only around one hundredth of an inch thick, will not have the same strength as a one inch thick piece of solid timber. The varnish will obviously lose the surface tension battle and will succumb to the superior strength of the baseboard and will end up being "pulled into" the dimensions of the shrunken baseboard, thus being the cause of the cracking effect we are so familiar with. The only cure for this, in the "dry hot air" situation, is to provide a method of introducing some moisture in the air in the vicinity of the picture. A favorite cure is to hang a small humidity source (a water container) over a radiator reasonably close (but not too close) to the picture so that the steady water evaporation fulfills the function of re hydrating the picture and restoring the baseboard to its intended size. This size difference between the hydrated and dehydrated state is extremely small, but it is nonetheless sufficient to cause the craquelure problem. 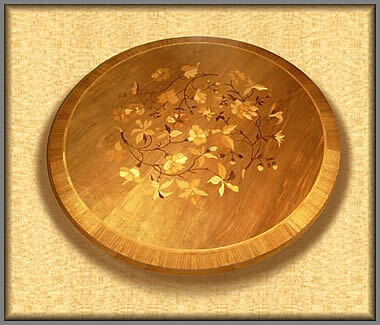 Inlay work is conserved and cleaned like ordinary polished furniture. Do not put them right over your radiator, insulate the pictures by under laid pieces of cork sheet if your walls are very humid. Try to conserve a minimum amount of air humidity in centrally heated rooms by hanging water containers onto the radiators. Let us now look at the other problem of the color fade in some of the veneers. The cause of this is ultra violet light produced from natural sunlight. The ultra violet light has the unfortunate effect of actually bleaching the color in some veneers. Generally these affected veneers are the mid and lighter toned ones. The darker veneers are, in the main, rather more color fast, so do not get affected so much by sunlight. Unfortunately the only remedy for this problem is to place your pictures as far out of the way of direct sunlight as you can afford to do. 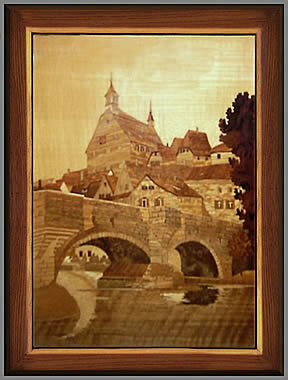 As far as we know, no one has so far invented a "sun screen" for marquetry pictures!!! The last part of this talk will look at the subject of restoration and whether "do you or don't you?" In the main we would advise against any form of restoration, as, whatever was done would significantly alter the picture's originality status. 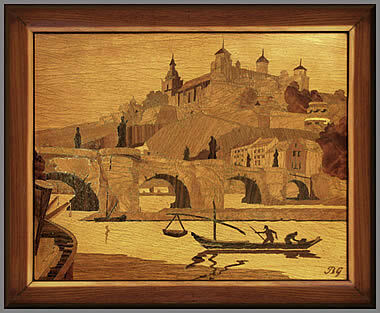 Craquelure and fading of veneer color are a natural process of time and environment working their magic on the pieces - they are to be expected to a certain degree in any piece of wood inlay work or marquetry. Indeed, if they weren't there in a piece of fifty years of age to some extent, you would be left wondering if the piece had been either hermetically sealed and stored in the dark for the last half century - or had been somewhat craftily restored? The important point of all this is that a true collector of genuine wood inlay and marquetry works is looking for originality complete with all its faults and flaws. Originality equals worth. 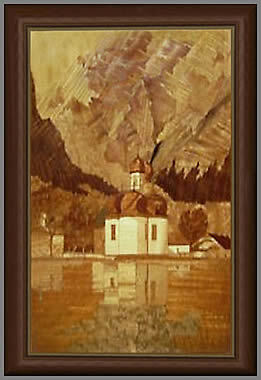 Restored works do not command the prices of the genuine original - so bear that in mind when considering any restoration work. Only use restoration when no other option is available - or the damage is so extreme that work is so near to almost collapsing that there is no other real alternative to preserving one of these valuable works. Click the above button to return to page 10 of "Can You Help"
Click the above button to visit page 12 of "Can You Help"